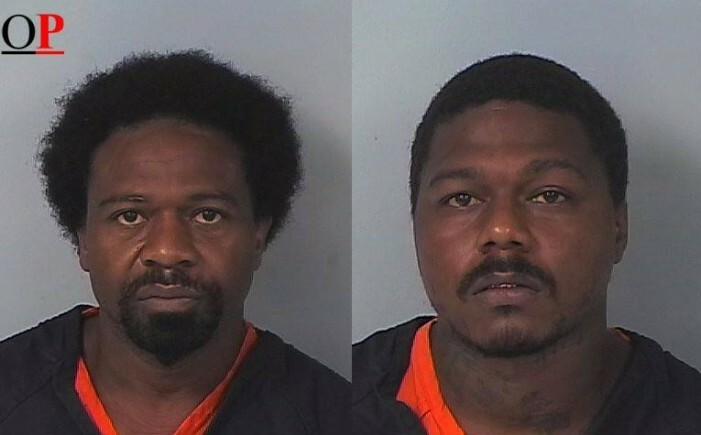 Howard Lee Holland Sr. [left] and Howard Lee Holland Jr.
Brooksville, Florida — (Official Press Release) On June 25, 2014, the Hernando County Sheriff’s Office Vice and Narcotics Unit executed a search warrant at 18341 Wiscon Road in Brooksville. The search warrant was the result of several months of investigation regarding drug traffic occurring at the residence. 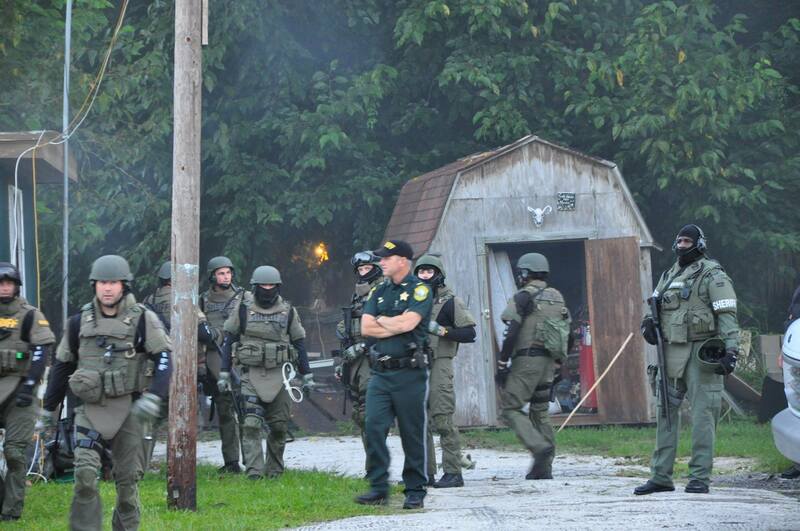 Just after 6:30 a.m., the Hernando County Sheriff’s Office SWAT Team along with the Citrus County Sheriff’s Office SWAT Team entered the property that consisted of three mobile homes and several out buildings. Once the property was secured, detectives from the Vice and Narcotics section conducted a search of which revealed 3.5 grams of crack cocaine, 123 oxycodone pills, scales and baggies with cocaine residue, $660 in U.S. Currency, and a .22 caliber handgun. Detectives observed several surveillance cameras throughout the property, as well as a warning sensor at the front gate of the property. Six dogs were also positioned around the edge of the property to alert the residents when someone entered. 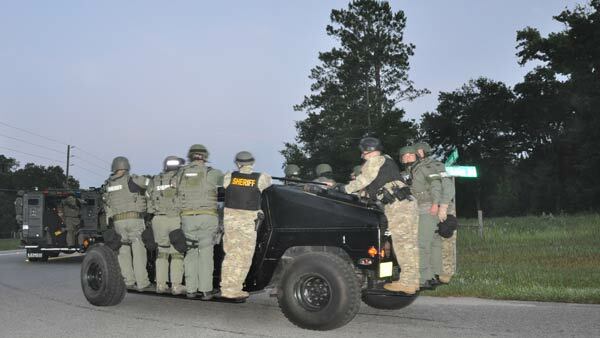 Hernando County Sheriff’s Office SWAT Team along with the Citrus County Sheriff’s Office SWAT Team executed a search warrant on June 25 at 18341 Wiscon Road in Brooksville. Detectives located Howard Lee Holland Jr., 29, in one of the mobile homes. Holland Jr. was placed under arrest on warrants. He was charged with sale and possession of cocaine, and sale and possession of crack cocaine. Pursuant to the search warrant, Holland Jr. was subsequently charged with trafficking in oxycodone, possession of a firearm by a convicted felon, possession of crack cocaine, and possession of paraphernalia. He was transported to jail with a total bond of $111,000. Detectives also responded to 19418 Oakdale Avenue in Brooksville where contact was made with Howard Lee Holland Sr., 51. He was arrested on two warrants. Holland Sr. was charged with sale and possession of cocaine, two counts of sale and possession of crack cocaine, and two counts of possession of a structure for the purpose of selling or manufacturing a controlled substance. Additionally, Holland Sr. was found to be in possession of a covert cash belt that contained $5,250. Detectives seized the belt and the cash. Holland Sr. was held on an $80,000 bond. Records indicate that Howard Holland Sr. is a convicted felon. He has a criminal history that includes homicide, aggravated battery with a deadly weapon, battery on a law enforcement officer, resisting officer with violence, sale of cocaine (x3), and possession of cocaine (x3). Howard Holland Jr. is also a convicted felon. His criminal history includes robbery, possession of a weapon or ammo by a convicted felon, possession of cocaine, and fleeing to elude law enforcement at high speed. According to Hernando County Sheriff’s Office records, this is not the first time that detectives have executed a narcotics-related search warrant on this property. One search warrant was served in November 2002 where six subjects were arrested on drug-related charges. The property owner, James William Holland Jr., was charged with sale and possession of crack cocaine. The next search warrant took place in February 2005 where eight subjects were arrested on drug and weapons-related charges, to include James Holland and Howard Holland Sr. James Holland is currently incarcerated at Gulf Correctional Institute on various cocaine-related charges. Aside from the drug charges, detectives were concerned about the condition of the dogs that were found on the property. They all appeared to be malnourished and emaciated. Most were chained to trees without food, water, or shelter. All but one was found to have dirt in their feces. Animal Services Officers were called to the scene in order to evaluate the dogs. All dogs were removed from the scene. Animal Services Officers also removed five kittens and eleven chickens. The search also revealed several safety hazard concerns with the structures. The Hernando County Building Department and Code Enforcement were called to inspect the structures. Said organizations determined that the electrical line running to the various structures were improper and posed a serious hazard. The floors and roofs to the mobile homes were sagging and unsafe. Numerous inoperable vehicles were found throughout the property, along with many discarded tools, furniture, and various other items that were also scattered throughout the yard. The Building Department made the decision to condemn all of the structures, and the proper notices were placed on the structures.